Islam is the world’s second largest religion, after Christianity, with more than 1 billion followers. Islam originated in Arabia and has spread all over the world. Countries with the largest Muslim populations include Indonesia, Pakistan, Bangladesh, Nigeria, Egypt, Turkey and Iran. Muslims believe that around 610 A.D. a man named Muhammad (c.570-632) from the Arabian city of Mecca started receiving revelations from God, or Allah, via the angel Gabriel. The revelations were collected into a 114-chapter holy book known as the Quran (or Koran), which Muslims believe contains the exact words of God. Muhammad is, according to Muslims, the final prophet in a line of prophets (including Adam, Abraham, Moses and Jesus) who were chosen by God to act as messengers and teach mankind. Muslims believe there is one, all-knowing God, and people can achieve salvation by following his commandments. In Arabic, Islam means “submission” or “surrender” (to God). A series of formal acts of worship, known as the Five Pillars of Islam, are fundamental to the lives of Muslims. The pillars include shahada (a declaration of faith: “There is no deity but God, and Muhammad is the messenger of God”); prayer (Muslims pray five times a day); zakat (charitable giving); fasting; and pilgrimage (Muslims are supposed to make a trip, or “hajj,” to the city of Mecca, Saudi Arabia, at least once in a lifetime if they are physically and financially able). 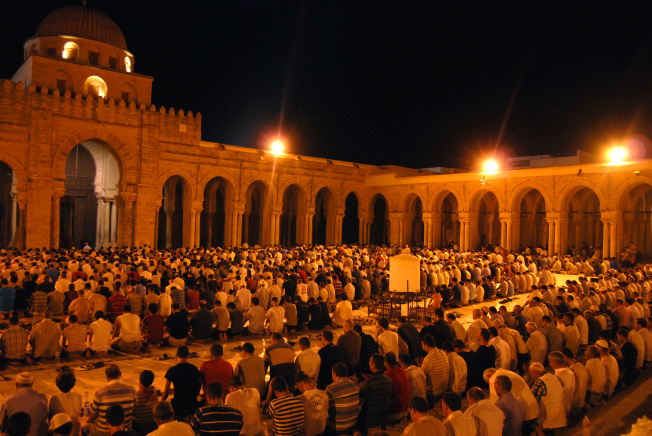 During Ramadan, Muslims fast from dawn to dusk each day. They are supposed to avoid eating, drinking, smoking and sexual activity, as well as unkind or impure thoughts and words, and immoral behavior. Ramadan is a time to practice self-restraint and self-reflection. Fasting is seen as a way to cleanse the soul and have empathy for those in the world who are hungry and less fortunate. Muslims go to work and school and take care of their usual activities during Ramadan; however, some also read the entire Quran, say special prayers and attend mosques more frequently during this time. All Muslims who have reached puberty and are in good health are required to fast. The sick and elderly, along with travelers, pregnant women and those who are nursing are exempt, although they are supposed to make up for the missed fast days sometime in the future or help feed the poor. The first pre-dawn meal of the day during Ramadan is called “suhoor.” Each day’s fast is broken with a meal known as “iftar.” Traditionally, a date is eaten to break the fast. Iftars are often elaborate feasts celebrated with family and friends. The types of foods served vary according to culture. The conclusion of Ramadan is marked with a major celebration known as Eid al-Fitr (or Eid ul-Fitr), the Feast of Fast-Breaking. It starts the day after Ramadan ends and lasts for three days. Eid al-Fitr includes special prayers and meals with friends and relatives, and gifts are often exchanged.